Note: This post contains spoilers on Prometheus. Do not read if you haven’t seen the film yet. Thinking about it more, I have answered some questions I had from Prometheus the other day. Why did the humanoid alien turn against the human race it created? Or is it? Ridley Scott never gave a clear answer on whether Prometheus is the prequel to Alien before its premiere. I heard that one of the writers said that Prometheus takes place on the same planet as Alien, but maybe that’s the only similarity. What really defines a prequel? The Star Wars prequels just led up to the original series. The Godfather Part II (which was also technically a sequel) showed Vito’s rise to power. And the upcoming The Hobbit: An Unexpected Journey will lead up to the discovery of the ring. But Prometheus isn’t really leading up to Alien. At the end of the film, Elizabeth and David decide to find the humanoid aliens to ask why they tried to kill the human race. So the film series (if there is a sequel) may not end with Ripley heading to the doomed planet. But my favorite parts of the film were the Alien references. I’m pretty sure those stone cartons (that’s the best way I can describe them) were actually aliens eggs that killed off the humanoid aliens. 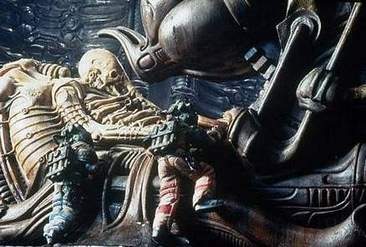 And who can forget that the alien’s suit was in Alien too (see below). And of course, that final scene featuring the alien popping out of the humanoid alien’s chest. Looking back on it, I enjoyed Prometheus more now than I did in the theater. That doesn’t change my opinion that the story is still weak, but the film still works well as a whole. I think the mark of a good film comes when it keeps you thinking about it days (or even weeks) later. Prometheus is one of those films. I can’t wait to see it again. I always like those films that make you think about them after you’ve seen them. One of my favorites is 2001: A Space Odyssey, a film that can never be completely understood, but is one of the greatest achievements in cinematic history. I think I should see Prometheus again too to find all the hidden message I missed. Thanks for commenting. Movie took place in 2083 or so. I think that the first engineer releasing his DNA on earth was on purpose. I think that 2000 years before the movie takes place they realize that they had created something that would eventually end up on their door step. When it did and the humans woke up the engineer, he went crazy because the observations were “true”. That does make sense that the engineer tried to kill the humans because he was afraid they’d eventually destroy his planet, which may be why they wanted to destroy Earth. I didn’t understand the intro when they created mankind at the beginning of the film until much later. 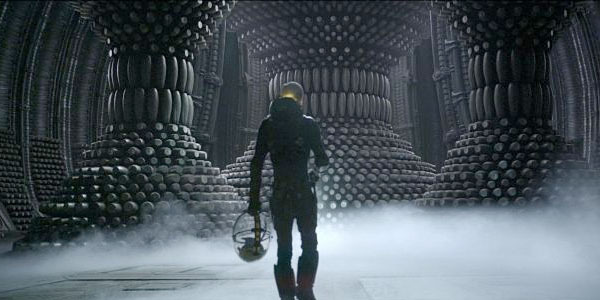 Ridley Scott will surely give us more answers in Prometheus 2, if there is one. I’m interested in learning more about these engineers.